OBDLink MX+ is an easy-to-use, inexpensive, hacker-proof, lightning-fast Bluetooth OBD adapter that can turn your smart phone, tablet, laptop, or netbook into a sophisticated diagnostic scan tool, trip computer, and real-time performance monitor. The ergonomically designed, small form factor device comes in frustration-free packaging, and takes an average of 3 minutes to install. The button on the back of the unit makes the connection process both easy and secure: unlike most other adapters on the market, MX+ neither broadcasts its presence, nor uses an easy-to-guess PIN to protect the communication link. A potential hacker would require physical access to the device, in order to connect to it. MX+ supports all legislated OBD-II protocols, plus advanced Ford & GM vehicle networks (MS-CAN and SW-CAN). MX+ works with all 1996 & newer cars and light trucks sold in the United States, and also supports EOBD, JOBD, and all other international variants of OBD-II. If you don’t require access to advanced Ford & GM networks, consider purchasing OBDLink LX Bluetooth. No additional fees to access thousands of OEM diagnostic codes and parameters, including ABS, TPMS, SRS, transmission temperature and more. OBDLink app for iOS, OBDLink app for Android, and OBDwiz are included with your purchase, free of charge! 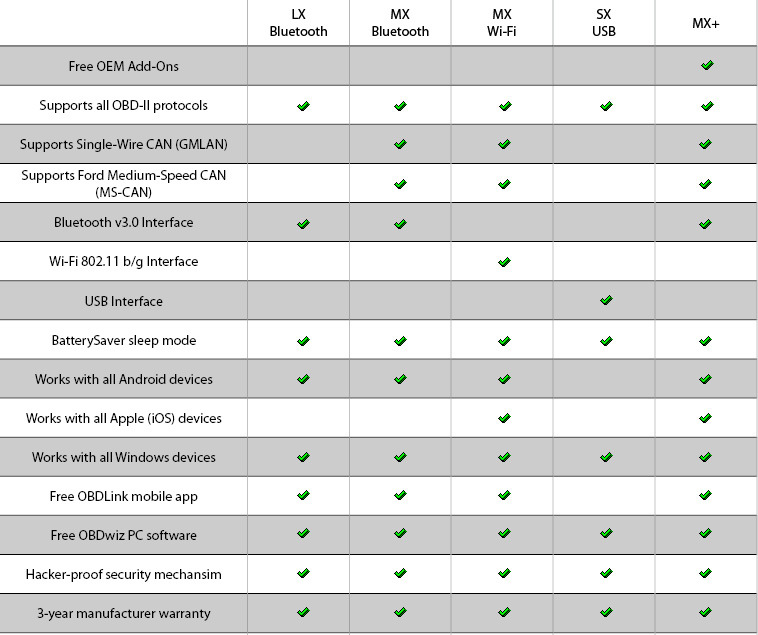 OBDLink MX is backwards compatible with the ELM327 command set, and works with dozens of third party apps including Torque, FORScan and DashCommand (check with each app provided to ensure compatibility with your device) on virtually every platform, across every device category — smartphones, tablets, laptop and desktop PCs. OBDLink MX+ works with all 1996 & newer model year cars and light trucks sold in the U.S., including all American, European, and Asian vehicles. Live outside the U.S.? Most newer non-U.S. vehicles are compliant with the OBD-II standards. Check here to verify that MX+ will work with your non-U.S. vehicle. OBDLink MX+ comes with an unconditional 90-day money-back guarantee, and a 3 year warranty.